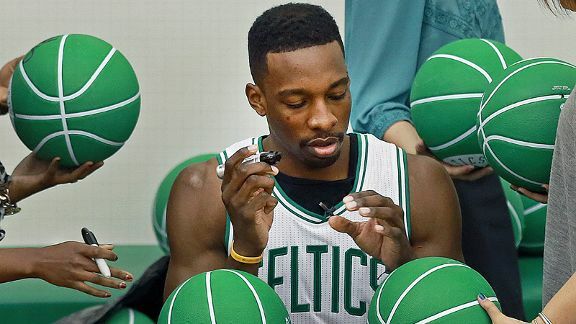 Celtics players often have a lot of balls to juggle on Media Day.The Boston Celtics will formally welcome the 2014-15 season on Monday when the entire squad convenes at the team's training facility in Waltham for media day. •Rondo's hand: Rajon Rondo already was going to be the center of attention before he broke a bone in his left hand during a fall at his house on Thursday. After missing much of the past two seasons due to ACL surgery, the Celtics were energized by the prospect of having a healthy Rondo for the start of the season, but now he's pegged to miss 6-8 weeks while recovering from Friday's surgery. Questions linger about exactly how the injury happened and Rondo will likely spend more time trying to explain an off-the-court incident than focus on what he and the Celtics are capable of on the court this season. • Turner's arrival: The Celtics and free-agent swingman Evan Turner agreed to terms back on July 21. Seventy-one days later, that signing ought to become official as the Celtics have pledged to have Turner officially added to the roster before camp opens on Tuesday. That means some additional roster shuffling looms, likely with Boston set to release some of the bodies obtained in Thursday's swap with the Cavaliers. (Update: The C's formally released John Lucas III and Malcolm Thomas on Sunday paving the way for Turner's addition). • Long time no see! While reporters have chatted with many of the Celtics this summer during appearances at community events, Monday will be the first time we interact with a handful of players. That ranges from veteran Gerald Wallace (the veteran is famous for his offseason hibernations and is coming off knee and ankle surgeries that shortened his first season in Boston) to rookie James Young (who hasn't talked with Boston reporters in a group setting since draft night). Marcus Thornton should talk for the first time since being acquired in a July swap, while more recent additions Dwight Powell and Erik Murphy should be available as well. • Hope springs eternal: Prepare yourself for a deluge of "Our team is going to surprise some people!" Coach Brad Stevens noted last week that "every team out of 30 is excited right now" and his players will be no different. It's a fresh slate and, despite projections that Boston will remain in rebuilding mode after winning just 25 games last season, we've already heard returning veterans talk about Boston's potential to exceed expectations. Until teams actually get on the floor and expose their weaknesses, media day and the start of camp is a period of unbridled optimism. What will you have your eye on during Monday's media day? Sound off in the comments.